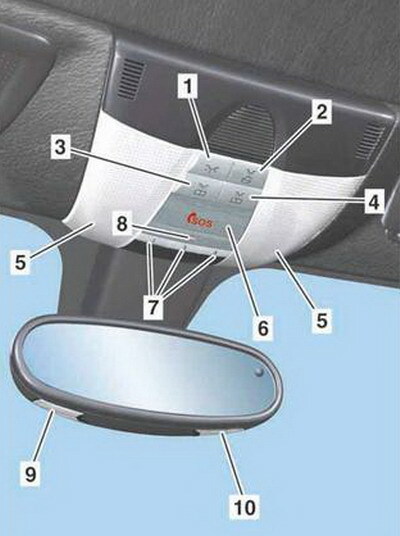 On vehicles without code 876, the left and right reading lamps are not installed on the underside of the inside rearview mirror unit but directly in the overhead control panel control unit. They are nevertheless actuated in the same way as on vehicles with code 876. Pressing the dome lamp ON and OFF switch (1) switches the left and right front interior illumination (5) in the overhead control panel on or off. Pressing the door contact ON and OFF switch (2) causes it to engage further in, which deactivates the automatic control for the interior illumination. Pressing the door contact ON and OFF switch (2) again causes it to disengage so that it is flush with the other switches. This reactivates the automatic control for the interior illumination. On vehicles with code 876, the automatic interior illumination only switches on in darkness. Pressing the left reading lamp switch (3) switches the left reading lamp (9) on the underside of the inside rearview mirror unit on or off. Pressing the right reading lamp switch (4) switches the right reading lamp (10) on the underside of the inside rearview mirror unit on or off. Pressing the SOS pushbutton switch (6) transmits an emergency call manually. An LED in the SOS pushbutton switch (6) flashes to indicate that an emergency call has been activated. The SOS pushbutton switch is integrated in the overhead control panel control unit but is read discretely by the emergency call system control unit (code 359). 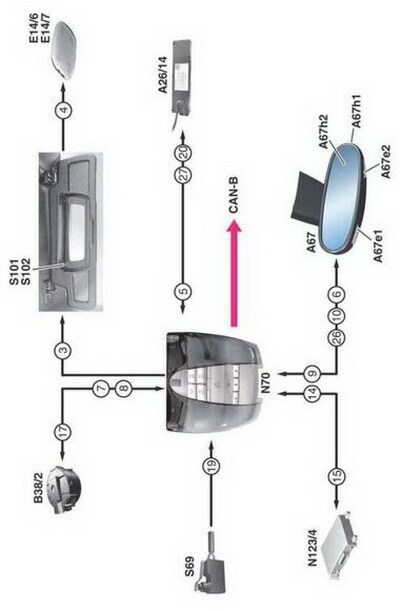 To actuate the garage door opener, circuit 15R must be switched on and the corresponding garage door opener button (7) must be programmed for the relevant garage door. Pressing one of the garage door opener buttons (7) opens or closes the garage door. The transmitter transmits for as long as one of the garage door opener buttons (7) is pressed. After a maximum of 20 seconds, the transmission is aborted and the garage door opener indicator lamp (8) flashes. Pressing the button again reactivates the transmission. The garage door opener indicator lamp lights up permanently. The indicator lamp flashes briefly and then lights up for approx. two seconds. This is repeated for up to 20 seconds. In this section we have some useful information about some Mercedes Benz 171 OverHead control System and it features.